Yep, paid. But you won’t spend anywhere near as much as you would with traditional advertising. In fact, you could spend less than a fraction and have your ad exposed to exponentially more people. So what is this low-cost advertising medium and why is it so effective? What it is — is Facebook advertising. And why it’s so effective is because it’s one of the most targeted forms of digital marketing there is. When you signed up for Facebook, what kind of information did you give? Your name, age, location? That’s data. And then as time went on and you continued to use the social platform what did you do? You shared your opinions and preferences on a whole host of topics. That’s even more data. And every active Facebook user has done this. And Facebook has all that data ready to sift through. So it’s not just about buying an ad spot but buying an ad spot that appears right in front of the exact people you want to see it. Facebook now has 2 billion monthly users. Even though the majority won’t be in your target market — your target market will be in there. Facebook ads are a powerful way to boost your site’s traffic and generate new leads. Facebook advertising is all about getting your business in front of potential customers. Here are the reasons why you should jump on the bandwagon. Let’s say you were contemplating purchasing a billboard on a busy intersection. Yes, many people would drive by and some would read it. But how many of those who read it are people likely to buy from you? How many of them are even interested in technology at all? The answer? Maybe some of them. Maybe none of them. With Facebook ads, you can set filters that will reduce your audience to only those you deem suitable. Only want to target people between the ages of 18-35, live within 5 km of your store and loves Apple products? With Facebook ads — you can. Facebook users are constantly checking their news feeds. Your ads will appear in these same news feeds. This means they’re exposed repeatedly to your brand and its content. Continued visibility will build trust and creates opportunities for remarketing in the future. Ads on Facebook are as affordable as you need them to be. The platform only incurs costs when someone actually clicks on or interacts with one of your ads. Naturally, if you’re able to spend more, the greater the potential for results. But, you’re able to set your own advertising budget. This ensures unexpected expenses will never blindside you. Many small businesses (your competition included), jump in without any kind of strategy. They omit the need for setting goals and measuring success against relevant metrics. This is your opportunity. Facebook’s advertising platform has evolved many times since its inception. It now has more features that will help get your ad seen by the right people. Here’s how. Once you’ve decided which one you’ll focus on, it’s time to think about how you’ll achieve it. A stock-standard approach is to create an ad, boost your content and expose it to more and more people. It’s a constant stream of one-shot stabs at a targeted market. But we’ll take it one step further. How? By implementing a similar strategy used in your content marketing. Our guide on the subject covered the 3 main stages that lead your audience down a path to purchase. Your Facebook ads will use a similar framework. Awareness — These ads will create awareness of your brand by providing valuable content. Consideration — This stage establishes your business as the local expert in your industry. Convert — The final stage for your ads pitches your business’ value proposition. So why is this better than the one-shot pitch approach? Because even though they’re ads, it’s still about building relationships. They aren’t on Facebook to shop. There’s plenty of other platforms to do that. But, once you’ve established a relationship then your pitch ads will be far more effective. So that’s all well and good, but how do you make sure that the ads people see match the stage they’re in? Facebook Pixels are tracking codes you put into the header or footer of your web pages. So when someone clicks on your Attract-stage ad to one of your blog posts — it gets tracked. The next time they come across one of your ads they’ll see the consideration ad. To do this you’ll need to go into your Ads manager and click “Pixels” under “Assets”. You’ll see a code that you’ll need to copy and paste into the header or footer of your website. From here you’ll be able to add keywords that will determine which pages people have visited from your ads. So let’s say your blog post URL is “phonerepairbiz.com/blog/diy-water-damage-repair”. You’ll include the parameter: URL contains “diy-water-damage-repair”. Then give the new custom audience a name to help identify it and click “Create Audience”. Now you’re tracking every person who visits that blog post from your ad. Which you can now use to set the next ad that will appear for that person. You can do this with all the pages your ads link to. And this will give you more strategic options for your advertising. Now it’s time to create the ads your audience will see. You’ll want to create at least one for each of the 3 stages. Let’s dive deeper. The first ads your prospects will see build awareness of your business. These ads promote content you’ve created and answer the big questions your audience has. This article should be similar in style to the regular content seen during a scroll through a news feed. This is to make it feel less intrusive as an ad amongst their social content. Understanding your audience is key here. Knowing what kind of content will resonate with them is how you get them to click. The next stage is to build your authority or demonstrate that your service is the best in the area. Ads in the consideration stage should logically follow on from your awareness ads. What does that mean? Let’s say your first ad advertised content about the most common iPhone problems. Then your consideration ad could be about “5 things to know before you get your phone repaired”. This is to leverage the initial interest of a prospect who now fits your target audience. Once prospects are seeing conversion ads they have indicated high interest. It’s now time to strike while the iron is hot. Your conversion ads are when these prospects take a real step forward on the path to purchase. So now, instead of promoting content, your ad could be to claim an offer or make a service request. Your audience is aware of your business, highly targeted and primed for conversion. When creating each of your ads, Facebook guides you through the steps. One of the most important is the “Audience” step. This is where you’ll define who will see your ad. So again, use your knowledge of your target customers when setting the filters. For example, make sure your ads only appear to those within your area. No point in wasting your budget with anyone not within driving distance of your store. Also, with consideration ads, set the audience as those who have clicked on your awareness ads. And the same for your conversion ads with consideration ads. Do this by selecting the custom audiences you created in Step 2. Daily Budget — A daily limit that will stop showing your ads that day once exceeded. Lifetime Budget — A total budget that will continue to show your ads till exhausted. Your budget will be dependent on your individual business. Just remember to consider all 3 ads when deliberating. You don’t want to spend your whole budget on your awareness ad and then have nothing left over for the others. You should be getting very familiar with this final step. And for good reason. Luckily, Facebook has two tools that make it a much more streamlined process. Page Insights and Audience Insights. Together, these tools arm you with the data you need. They will cover in detail your reach, engagement, likes, posts, and audience. Use these metrics to determine which of your ads are performing well and which aren’t. And then adjust accordingly. Let’s say your awareness or consideration ads are underperforming. You could create new ads or promote different content. For the conversion stage, it could mean advertising a different offer or call to action. Effective Facebook advertising requires constant testing and optimizing. When it comes to marketing, one of the major hurdles is reaching the right audience. 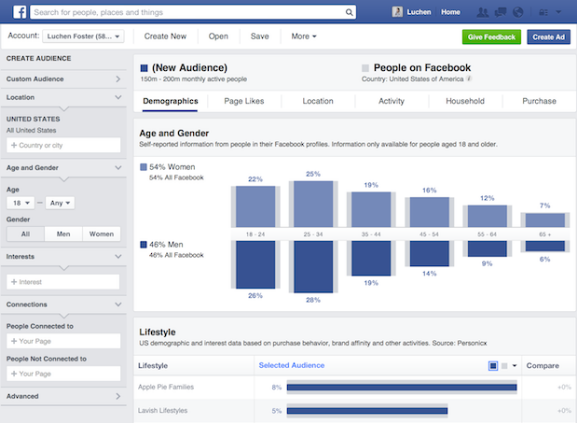 Facebook, with its hordes of data and analytics engines, does the heavy lifting for you. No other form of online advertising has precision targeting on par with its ad platform. As a small business, you may be wary of using Facebook Ads. But if want to grow and you have a limited budget — it’s one of the most powerful and cost-effective tools available.